THE 4TH ANNUAL BLACK FRIDAY NIGHT MARKET!!! We started out in 2015 with a small idea to provide a platform for local businesses and creatives we wanted to shine the spotlight on. Join us on November 23rd, for another evening of fine creativity music and good eats! This event is produced in partnership with Newark.FM (which is celebrating their 1st year anniversary) Big up to woman led companies doing their thang. Anyway, I’ve already said too much be there or be square!!! Sign up with your email address to confirm your attendance. We are kicking off our Summer Series House Party Style. Indoor/Outdoor. Complimentary Goodies. Original Vibrations. JOIN US ON APRIL 21st!New Vendors, New Performers, Same Vibrations! A creative evening of collaborative expression for guests to gain some momentum and input on personal projects in a welcoming social environment. Bring your ideas. Bring your tools. Bring your soul. This event is dedicated to all those “let’s build” requests left on read. Thank you! See you on April 7th! Let's Get to Work!!! JOIN US FOR AN EVENING OF CELEBRATION OF THE RANGE AND COMPLEXITIES OF EXPRESSION WE ARE INNATELY BORN WITH WHILE SHEDDING THE IMAGINARY BOX OF SOCIETIES PERCEIVED NARRATIVES FOR WHAT IT MEANS TO BE A BLACK HUMAN BEING. WHY DO WE CALL IT BLACK FUTURE MONTH, YOU ASK? OUR PAST INFORMS OUR FUTURE BUT WE ARE NOT DEFINED BY IT. CONTINUING TO BE OUR ANCESTORS WILDEST DREAMS, WE LOOK TO THE LIMITLESS POSSIBILITIES TO SHAPE OUR FUTURES. JOIN US AS WE SHARE OUR GIFTS, CONNECT WITH ONE ANOTHER AND ACTIVATE CHANGE IN OUR COMMUNITY. Docyouments is a photo journal and magazine focused on self care, art, wellness, literature + community. FILM SCREENING OF JENN NKIRU'S "REBIRTH IS NECESSARY"
SIDENOTE: COME THROUGH DRESSED CHANNELING YOUR FUTURE SELF IF THAT'S HOW YOU FEELIN. THE OPENING CELEBRATION OF JERRY GANT'S "GANTALISM OUTPOST"
IF YOU DON'T YOU'RE ABOUT TO FIND OUT. 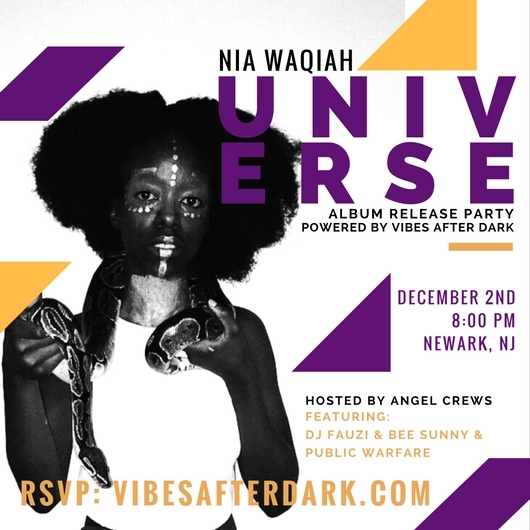 It is with pleasure that we invite you to share a special evening filled with healing and live sounds to celebrate the release of Nia Waqiah's body of work entitled, "UNIVERSE". JOIN US FOR A SPECIAL RENDITION of Vibes After Dark: Night Market on November 17th, 2017. @Hycide and @VibesAfterDark, are joining forces to cultivate another unforgettable experience in which we access the beauty in resistance. Community and Culture are vital to survival. BE present with us. CONNECT with your kinfolk. CREATE your reality. is a series dedicated to celebrating and highlighting creative women. Our combined efforts produce a greater sum than our separate effects. We're uplifting that sisterhood through creativity and setting our intentions. Express yourself! We've partnered up with THEM CLOUD KIDS Non - Profit Organization to host a book drive at our event. Your book donations will help to further provide their incredible programming for the youth at their future installments of "Culture Class". A new selection of vendors, talented artists, and as always good vibes! WE WOULD LIKE TO THANK ALL OF OUR AMAZING GUESTS FOR ALWAYS SHOWING UP, SUPPORTING LOCAL ARTISTSANS, MUSICIANS AND SHOWING OUT. The first 20 attendees w/ an RSVP will receive some freebies! Vibes After Dark is established to fill the void as a landmark and platform for local artisans, small businesses, and creatives of all realms to showcase their skills or products. We set out to build continuity within the community on the economic, social, and vibratory plane. Our calling card is to merge the vast, but scattered influx of creativity, music, and good eats under one roof to manifest this experience for us and by us.